Orange and Black Hand Carved Sese Wood Adesewa Mask, "Orange Adesewa"
"Crowned beauty," proclaims the name of this mask, from the Yoruba language. The face is painted in orange and black and crowned with a black headpiece, all carved from local sese wood by Ghanaian artisan Abdul Aziz Mohamadu. The rounded diamond shape highlights the pointed chin and high forehead, used in many kinds of African masks as a representation of idealized beauty. 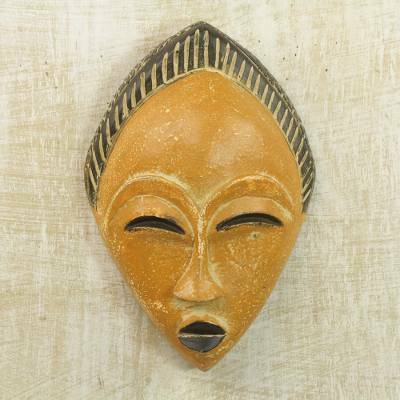 You can find african wood mask 'Orange Adesewa' by Abdul Aziz Mohamadu in masks categories such as Cultural Masks, Ghanaian Masks, Folk Art Masks and Wood Masks. Enjoy exploring these sections for other Novica treasures. I have an extensive collection of African masks but not one with this shape. The color is not orangy orange but is as pictured. I needed to add color to my collection.